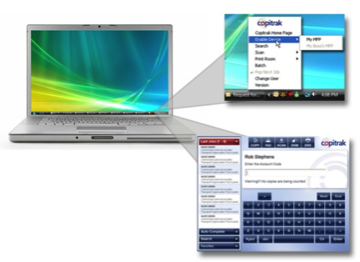 With a Patent Pending, the Copitrak Desktop is the industry’s first and only PC centric Cost Recovery platform. Copitrak Desktop leverages the power of your existing PC fleet to track, manage and control all aspects of the Cost Recovery System. Utilizing the Device Enablement Feature users can enable and track any Copier/MFP device by simply clicking on the Copitrak Desktop icon located in the System Tray. Devices that are already in use will be grayed out. After selecting a device the user will be prompted to enter an Account code via Copitrak’s award winning User Interface all from the convenience of their desk.Features like Last Job Recall, Account Search, Auto Complete and Favorites are what make the Copitrak Interface the most user friendly on the market today.Once the user has entered or selected an Account code the device will activate automatically. All walk-up activity will then be tracked to that Account code. In addition to the Device Enablement Feature, the Copitrak Desktop platform allows for tracking and management of other key components of the Firm’s Cost Recovery solution. Copitrak Print Room job submission module and the Copitrak Editor transaction management software.